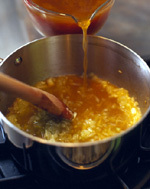 FoodSoftware.com specializes in training materials for restaurants, bakeries and other food businesses, as well as culinary schools and public libraries. Training materials are DVDs, books and software concentrated in the areas of training materials for food business owners, management, waitstaff, chefs, bakers and culinary students. FoodSoftware.com is proud to feature the complete catalog of training DVDs from the Culinary Instititue of America (the "gold standard" of culinary DVDs) and the large selection of wonderful food- and food-business DVDs from the History Channel's Modern Marvels series. Training Libraries: FoodSoftware.com offers a variety of "library bundles" of related materials at substantial discounts compared to purchases of individual titles. Libraries may have 5, 10, 15 or as many as 20 or so DVDs in their collections. Teaching basic service skills to employees who have never worked in the restaurant business before. These training DVDs cover training for most public service positions- waitresses, waiters, bartenders, busboys and hosts. Teaching advanced skills to experienced waitstaff in fine dine restaurants. Teaching selling and upselling skills for waitstaff of all levels. Teaching wine knowledge and service skills for fine dine waitstaff. Click on the links below for detailed information about our key restaurant training products. 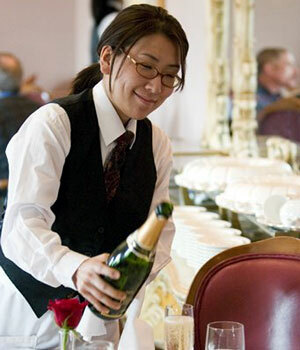 Essential, general restaurant front-of-the house training for waitstaff, including waiters, waitresses, hosts and bussers. 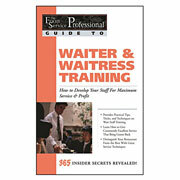 From-the-beginning and advanced detailed training for waiters and waitresses. Directly contrasts perfect technique against bad service. 29 items found searching fields. 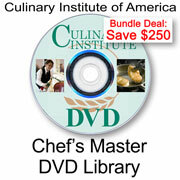 This DVD by the world-renowned Culinary Institute of America (CIA) teaches the fundamentals needed to work in a professional kitchen. Designed for those responsible for the daily set up, preparation and maintenance of a kitchen, the Basic Kitchen Preparation Series covers preparations prior to cooking, flavorings, vegetable, dairy... more. Designed for chefs who specialize in the preparation of cold foods, the Garde Manger training videos show you how to prepare and present a variety of items from the cold kitchen that are sure to entice your customers. Developed by the world-renowned Culinary Institute of America (CIA) this 3-part DVD demonstrates the presentation and prep... more. Food costs and menu pricing can make or break your restaurant or foodservice business. The Culinary Institute of America's Recipe Costing DVD will help you uncover the secrets of controlling food costs and help your operation realize higher revenues. Topics include: Learn the importance of standard recipes and portion sizes. Wat... more.